So it is with awe that I discover that the man I am chatting to at tea not only does a headstand every morning of his life, but can do one on this very kitchen table, if it is required. Although he does worry that he might disturb the chocolate cake. The man is Jonathan Guinness, 3d Baron Moyne, who recently celebrated his eightieth birthday. Not for a moment would you think he is eighty. He is handsome, with the brilliant blue eyes of his late mother Diana Mitford, and is possessed of a slim figure, dressed in casually stylish clothes and quite enviable posture. I find myself flirting with him, and feeling pleased that he is giving more attention to me than to Jerry Hall, who is seated opposite us. Being endlessly fascinated by people who can keep not only their health and vitality but also their looks, as they age, I interrogate him about his yoga practice. 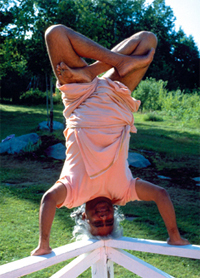 Never having been athletic, he took up yoga after he and his late partner Shoe were given a free lesson at the Sivananda Centre in London in 1979. ‘We loved a freebie!’ he laughs. Since then, apart from one brief period when he had Sciatica, he has practiced religiously, every morning immediately upon waking up, while still in his pyjamas. I ask him how he found the will power to do the daily practice. He says he simply made up his mind to do it. There are many different styles of yoga, which can be very confusing for people. Jonathan has tried most of them, including the Ashtanga style favoured by the likes of Madonna and Sting. It is a routine that he seldom varies. We agree that people have days when they don’t feel like doing yoga. He claims not to be very disciplined in general. He also incorporates breathing exercises and meditation into the daily routine. There have been many noticeable benefits from the practice. ‘There is no question that it does help the circulation. And above all it helps the mind, it makes the mind clearer. He is not sure if he believes, as the yogis do, in re-incarnation. But he would like to. Has he always been very healthy? ‘I really mustn’t grumble. I had appendicitis, which did nearly kill me, that was when I was about ten. Otherwise I have been okay. He watches his diet, but not too strictly. Jonathan keeps his mind busy. He has written three books and is currently working on two more. He has survived two wives and his late partner, and has fathered eight children. He gets great pleasure out of his children he tells me. He believes that yoga helps with relationships, as well as with the body. I ask if he would recommend yoga? ‘I would recommend it to anyone. I would say to people just have a go, even if you think you wont be any good.